U.S. News & World Report ranked the University of Georgia in Athens the nation’s 16th best public university in 2017. Together, UGA and Athens Technical College produce an educated and highly skilled talent pool that is 34,000 strong and growing. 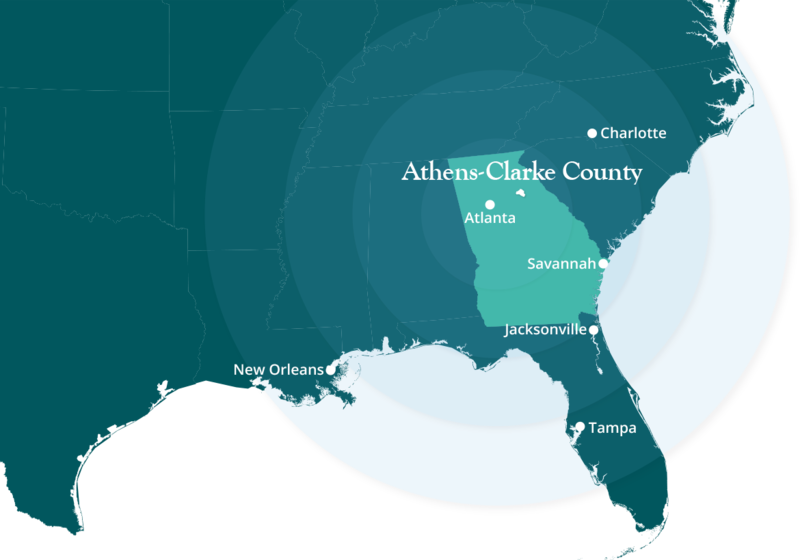 The Athens-Clarke County metropolitan area serves as an employment, cultural, educational, and business center for surrounding counties and all of Northeast Georgia. Athens-Clarke County boasts a diverse business mix, with major Fortune 500 companies and local entrepreneurial startups calling the area home. The County has a rich manufacturing history and a strong industrial base that provide a formidable business foundation in the heart of the Southeast U.S. Athens-Clarke County offers a variety of state and local incentives to new and expanding businesses in the area, including homestead and Freeport exemptions. These incentives, along with low taxes, a low cost of living, and a powerful workforce of more than 34,000, make the county an attractive choice to businesses seeking the perfect location for their operations. Business climate, logistics, demographics, infrastructure, taxes, and more. Discover the ins and outs of Athens-Clarke County. A comprehensive overview of the key industries that have a significant impact on the Athens-Clarke County economy. Options for companies and entrepreneurs that make doing business in Athens-Clarke County advantageous. Our community has it all. A moderate climate, proximity to a major metro, top healthcare institutions, plus the culture, opportunity, and excitement of a college town. Area maps - interstates, flight times, ports, and more - visually paint the Athens-Clarke County picture. US universities in new products reaching the marketplace, 4th consecutive year. © 2018 Athens-Clarke County Economic Development Department. All rights reserved.